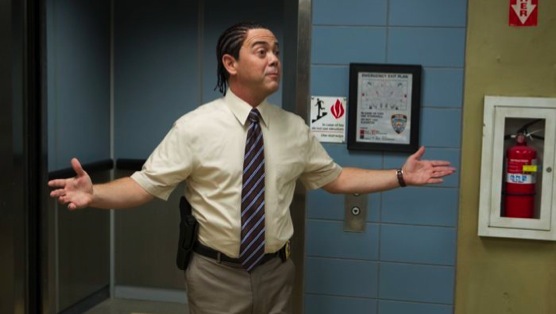 How do you give Joe Lo Truglio cornrows without according the entire cast of Brooklyn Nine-Nine ample opportunity for joint ridicule? If the entire squad can spend a protracted opening segment making fun of the Sarge for making the grown-up choice to get a vasectomy, then why can’t they also get together to squeeze off a full clip of puns and potshots at Boyle’s new ‘do? This is such a huge missed opportunity that “Chocolate Milk” forfeits a few decimals as soon as everyone’s favorite sadsack detective reveals his Jamakeover, but the rest of the episode is so strong that the point reduction feels as petty as Captain Holt’s feud with Madeline Wuntch. Which comprises the single funniest element of “Chocolate Milk”—no small feat, given that the whole installment ratchets up the humor from last week’s “Undercover”. Look, nobody of sound mind will say that the season premiere wasn’t funny, but the two simply don’t compare. “Undercover” bore the burden of series maintenance. “Chocolate Milk” doesn’t have to perform basic set-up, and instead can do things like present a vignette of Jake taking care of a very drugged-up Terry. You probably didn’t realize that the sight of Andy Samberg brushing Terry Crews’ teeth is necessary for living a full, complete life; allow Brooklyn Nine-Nine to fill that gaping hole in your existence. But “Chocolate Milk” always comes back around to Andre Braugher sparring with Kyra Sedgwick. If Holt hovered at the edges of the frame in “Undercover”, he’s almost smack dab in the center here, though admittedly his back and forths with Wuntch get secondary billing in one of the B-plots to Jake’s and Terry’s A-plot. That’s fine, though; Braugher and Sedgwick make the most of their screen time together, turning a professional feud between two buttoned-up androids into a rich vein of understated hilarity. Just listening to Braugher enunciate is enough to slay (“Ripe and crispy” could well be the greatest thing he has ever said), to say nothing of his incredible body language. This simply affirms earlier predictions about how Holt’s sexuality and his continued campaign to whip the precinct into tip-top shape would inform the direction of Brooklyn Nine-Nine’s second go-round. Back patting aside, the former makes its impact in an unexpected way, and the latter wraps itself up so neatly here that viewers may feel safe assuming that Wuntch is done with the Nine-Nine crew, and won’t be leaving Hades again anytime soon. That’s a mistake; we know that Sedgwick will make one more appearance further down the line, which is great, because she proves an incredible match for Braugher as a comically emotionless authoritarian. And c’mon, scoring a 2.7 on an office inspection isn’t going to mollify department brass. We’ll be back here before long, watching Holt and Wuntch go toe to toe to hopefully find out exactly how she embarrassed herself in front of Derek Jeter. Their longstanding rivalry drives home the running theme of friendship in “Chocolate Milk”, though the episode’s other pairings—Jake and Terry, Boyle and Diaz—both wind up in much sunnier places. Frankly, the peaks of sweetness in Diaz’s decision to step in to help Boyle out with his awkward personal life make their side narrative feel more successful than Jake’s incessant pestering of Terry. Somehow, seeing their bromance unfold almost feels unnecessary, but then again, we really only have seen them engage as work friends, rather than friend friends. Jake lives his life coasting on assumptions about how his coworkers feel about him, and “Chocolate Milk” gives him a chance to examine those preconceptions (while also offering a surprisingly emotional glimpse into Terry’s masculinity). Both men come out stronger in the end, though Jake should probably see a chiropractor. (At least he’s eating carrots now, albeit grudgingly.) And Brooklyn Nine-Nine continues to show its strength as an ensemble comedy, though lingering questions remain over how the overarching stories introduced in “Undercover” will impact the series going forward. Given how well “Chocolate Milk” handles its pursuit of character, though, maybe those don’t matter much just yet.